Joining at a time when women were very much on the periphery of policing, Beth Ashlin’s ground-breaking career saw her go on to become Tasmania Police’s first female Inspector. Throughout her 30-year career she also became the first woman police officer to supervise male Constables; she was a champion of equality, a decorated police officer and a deadeye pistol shot. After joining in 1956 at the age of 25, she overcame significant hurdles to rise through the ranks. Women police officers had a very limited remit and did not receive any formal training, making it difficult to pass promotional exams. If they did pass exams they could only apply for roles within the Police Women’s Section. At the time Constable Ashlin was aiming for promotion, the Section comprised fewer than a dozen positions statewide. As a Constable in 1975 she made a request to go on a three-week study trip to Victoria Police to examine the integration of women police officers. Her findings helped accelerate the process of integration in Tasmania, with the 1970s proving to be a period of rapid change for women in policing. It was also at this time (1976) that Sergeant Vera Webberley, the first woman to achieve that rank, retired from her role in charge of the Police Women’s Section and Constable Ashlin was promoted to take over. She went on to become Sergeant on the Hobart Watch where she was the first female to supervise men. In 1978 she was promoted to the rank of Inspector. During an interview in 2005, almost 20 years after her retirement, Ms Ashlin said that one of her key achievements was helping to create a new working environment for women police officers. She worked steadily throughout her career to overcome and overturn discrimination, with the 1970s seeing women police officers receive a standard uniform, the same training courses as men, pay parity with men, access to promotion opportunities and much greater integration of duties. 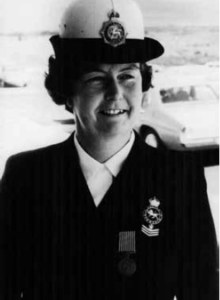 She received Commissioner’s Commendations for her work in the 1967 bushfires, assisting CIB in a murder investigation and for the arrest of two drunk drivers. During the 2005 interview she mused that arresting drunk drivers was considered beyond what was expected of women police officers at the time. A school teacher before she joined policing, she also represented Tasmania in pistol shooting at the Australian National Championships on at least five occasions and was a Lieutenant in the Women’s Royal Australian Army Corps of the Citizen Military Force. She died in April 2016, aged 84. Following her death, Facebook comments from those who had known her personally and professionally described her as “an inspiration”, “ahead of her time”, “a good friend”, “a mentor” and “admired and respected”. This page -- https://www.police.tas.gov.au/about-us/100-years-women-policing-tasmania-police/profiles/beth-ashlin/ -- was last published on December 7, 2017 by the Department of Police, Fire and Emergency Management.